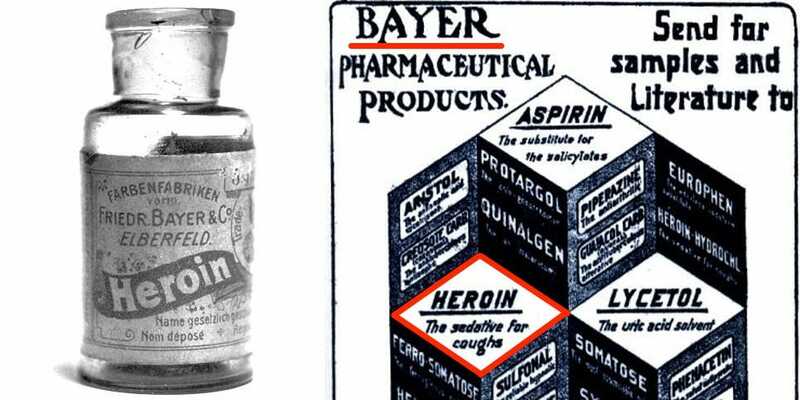 Bayer, the German pharmaceutical company that produces aspirin, commercialized heroin in the 1890s as a cough, cold, and pain remedy. What’s really shocking, however, is that Bayer marketed heroin for use in children as late as 1912, years after reports began to surface that it could be a dangerous drug. In 1914, heroin was restricted to prescription-only use in the U.S. and eventually banned by the FDA altogether in 1924. Did you know that the U.S. government paid the Zapruder family $16 million for the film of JFK's assassination in 1999? They did. Or should I say, we did. In the mid-1960s, Slumber Party Barbie came with a book called "How to Lose Weight." One of the tips was "Don’t eat." When asked if he knew the speed of sound, Einstein said he "didn't carry such information in my mind since it's readily available in books." The last time a Republican was elected president without a Nixon or Bush on the ticket was 1928. That Republican was Herbert Hoover who became the 31st president of the United States a mere eight months before the Stock Market Crash of 1929. Sea otter couples hold hands when they sleep so they don't drift apart. Yes, it's true! In 1973, Mao Zedong told Henry Kissinger that China had an excess of females and offered the U.S. 10 million Chinese women. There are 9 million more women than men in Russia. In fact, it is said that Russia's population has fallen by 6.6 million since 1993. Each Russian consumes 18 litres of alcohol per year on average, doubling what experts consider as dangerous. There are more than 500,000 alcohol related deaths each year in Russia And believe it or not, beer only started being classed as alcohol in Russia in 2013. Talking about boozers, when fruit flies are infected with a parasite, they self-medicate with booze -- they seek out food with higher alcohol content. In 1493, Columbus thought he saw mermaids. They were "not as pretty as they are depicted, for somehow in the face they look like men." It was probably manatees. When the Westboro Baptist Church protested a soldier's funeral in Oklahoma, their tires were slashed. People in town refused to repair them. An early ATM was deemed a failure because its only users were "prostitutes and gamblers who didn’t want to deal with tellers face to face." The American Psychiatric Association’s DSM-V handbook classifies caffeine withdrawal as a mental heath disorder. On May 15th, 2014, it was reported that Dave Harrell of Edmond, Oklahoma, caught an "Alligator Snapping Turtle" on a rod and reel at Eufaula Lake in Oklahoma. It is the biggest he had ever seen. It is typically the largest freshwater turtle in the world based on weight and can live to be 200 years old. The beast weighed over 100 pounds. And yes, they were just out fishing for catfish. Columbus struck land in the Caribbean and also explored Central and South America, but he never set foot on North America. Nonetheless, the U.S. celebrates Columbus Day every year. Also, thinkers as far back as Pythagoras, a Greek mathematician in the sixth century B.C., knew the world was round. Columbus even supposedly planned his trip using a copy of Ptolemy's "Geography," which included theories about the world's spherical shape. President George Washington did have horrifically bad teeth. He even wore multiple sets of dentures throughout his life made of ivory, gold, and lead -- but not wood. According to the organization that runs President Washington's famed estate, Mount Vernon, President Washington did love his Port wine though. The burgundy-colored drink may have stained his teeth, making them appear brown and grainy, like wood. The Great Chicago Fire killed hundreds and burned more than 3 square miles in 1871. Contrary to popular myth, the blaze actually started in a small alley for unknown reasons. The journalist who attributed the blaze to "Mrs. O' Leary's cow" knocking over a lit lantern admitted he lied and made up the story. Yes, we haven't been able to trust the news media for years.